Arp 240 interacting galaxies....Hubble Space Telescope data from the Hubble Legacy Archive processed by Lynn Hilborn, March 27,2013. NGC 5257/8 (Arp 240) is an astonishing galaxy pair, composed of spiral galaxies of similar mass and size, NGC 5257 and NGC 5258. 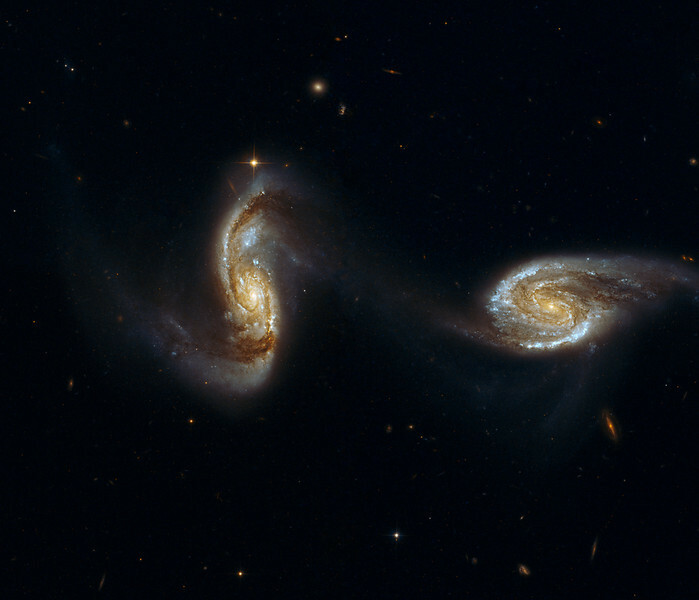 The galaxies are visibly interacting with each other via a bridge of dim stars connecting the two galaxies, almost like two dancers holding hands while performing a pirouette. Both galaxies harbor supermassive black holes in their centers and are actively forming new stars in their disks. Arp 240 is located in the constellation Virgo, approximately 300 million light-years away, and is the 240th galaxy in Arp's Atlas of Peculiar Galaxies. With the exception of a few foreground stars from our own Milky Way all the objects in this image are galaxies. Data from the Hubble Legacy Archive established by the Space Telescope Science Institute, the Space Telescope European Coordinating Facility and the Canadian Astronomy Data Centre.